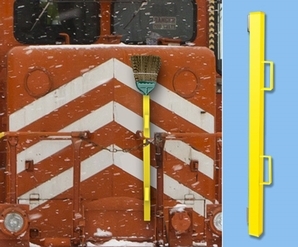 A handy way to carry a switch broom on board a switching locomotive or Trackmobile. Powder Coated stainless steel holder (60" long) has two pairs of powerful rare earth magnets to hold it in place on side wall of locomotive or shunter. Drain hole at bottom. Order broom separately.